Hi! Does anybody know which Playing With Knives version Richard "Humpty" Vission used on his CD Mix Drop That Beat? I've heard almost all versions except that one which I had a chance to purchase back 1995 and left it behind. Can't remember the label! Plutonic absolutely awesome track timeless memories RIP Bess X . Absolute stone cold rave classic. A tune that still sounds superb day - killer piano riff, massive breaks and those synth lines combined with a great uplifting vocal and voila a timeless classic. Danced to it at the Hacienda back in the day and still dance to it today, albiet slightly more slowly and less under the influence! The Climax & Love 91 mixes are nearly unrecognisable as versions of the Quadrant mix. The first 3 beats of "Playing With Knives" are missing in this release which makes hard to mix into the next track. "Playing With Knives" in STORM 25 plays ok."Plutonic" is quite enough for everyone to have this on his record library. Plutonic Is A Quality Track..Hard Little Number That Still Sounds Good..To Me It Does!! The demo version of this tune was created at Andy Meecham's house. After sending a demo tape to Vinyl Solution, J. Saul Kane & Alain from the label invited them down to sign. Out Of The Blue studios was chosen to make the proper version of the tune due to them being big fans of 808 State who also recorded there. 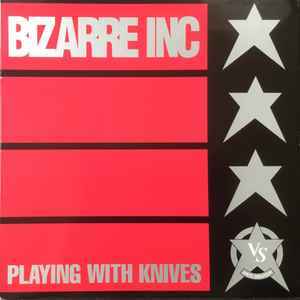 Carl Turner from Bizarre Inc gave the track it's name. The first DJ to be given a copy was Graeme Park who first dropped it at Quadrant Park in Liverpool (hence why the main version is called the Quadrant mix.